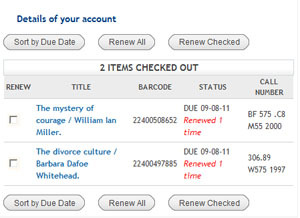 You can renew checked out library books in two ways: 1) bring them to the circulation desk, or 2) renew online. 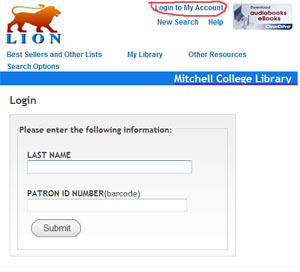 To renew your books online, simply login to your account from the library catalog screen by clicking on the Login to My Account link on the top right corner of the screen. On your account page, in the box called "Details of your account," you should see the books that you have checked out. Simply check the box next to the items you want to renew, and select the "Renew Checked" button, or select the "Renew all" button to renew all of your checked out items.